The story follows Jude, a young human girl living in the High Court – although she doesn’t really belong. She has been living there since a child, since her parents were brutally murdered, and her High Court protector is none other than the fae that she watched murder her parents. As a human she will never belong the only home she has ever really known – and belonging is the one thing her heart and mind truly desires. This aspect of the story certainly has a element of Stockholm syndrome. Jude, unlike her siblings, wants nothing more than to be accepted by the court, to belong. And she seems to have flicked the switch to ignore the cruelty of her situation and has just accepted the past for what it is and is trying to make the best life possible for herself with the hand that she has dealt. I can’t say I really liked Jude. She certainly has good qualities – she is strong, quick, protective, unwavering. As a human, she has built an amour to protect herself from the fae around her, but she knows herself that she is still vulnerable. But I found her ability to ignore the past a little unnerving, and her determination was actually blind stupidly at times. Jude suffers from unrelenting bullying throughout the story due to her humanness, and this has made Jude tough – she is resilient and smart, but sometimes her pure determination to cement her worthiness makes her blind to actualities of her situation and surrounding. 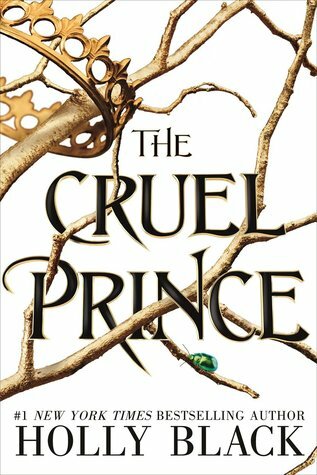 The cruel prince, otherwise known as Prince Cardan, was a definitely a jerk, but not quite as cruel as I expected him to be. In fact, it was Jude’s reactions to most of it that had me more frustrated than the cruelty itself. But I did enjoy the intrigue of this character – the underlying suspicions, the manipulation, the uncertain motivations, and the question mark that surrounded his actions. And while he was an asshat, I still found him to be complex and intriguing, and I just wish I could have more of his story. This story is filled with despicable characters – both fae and human. In fact, there were not many characters that I actually liked. But this isn’t a bad thing – I actually enjoy books with unlikeable characters. I find it interesting and disconcerting at the same time. Overall I found this book to be enjoyable. It was slow to get into but I found this was because the world was being built and the characters had backstories to bring into the picture. I actually enjoy a good world building, so I didn’t find this to be negative or distracting. I don’t’ feel the need to connect to characters all the time, especially when it comes to stories and characters with fantasy elements. I mean I can sit here in my very human state, in my very human world and say that I wouldn’t do what that character did, or I wouldn’t feel that way, but at the end of the day who knows what I would think or do if I was a fae world – or if I was fae myself! This is something that I will never know (well, I don’t think I ever will). So the element of having unrelatable characters in an unrelatable world sits okay with me. The storytelling was amazing. In true Holly Black style, the fae aspects are very well thought out, with beautiful descriptions and cruel undertones. The story is filled with half-truths, untrustworthy perspectives, twists and unexpected surprises For anyone who enjoys the cruel fae world, I definitely recommend you pick this one up.